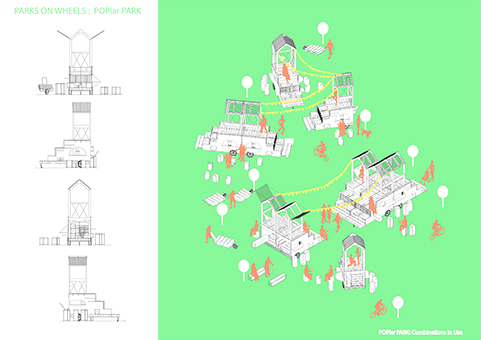 Bartlett graduates Georgina Halabi and Alex Anderson are one of six winning teams selected to design a series of moveable parks in east London as part of the 'Parks on Wheels' competition organised by Ash Sakula Architects. The competition sought 'attractive, playful and engaging' community gardens which can be moved by no more than five people to a new site. It is a pilot project to use undeveloped sites and transform them into moveable community gardens. The winning teams will collaborate to produce three moveable gardens based on their competition-winning designs. The finished gardens will be unveiled at Canning Town Caravanserai in east London on 1 April. Georgina and Alex studied BSc Architecture at the Bartlett School of Architecture and are currently on their RIBA Part 1 year out placement at Peter Barber Architects.